In the summer of 1928, Yenching received a pledge of $90,000 (equivalent to over a million in 2012) for a new women’s gymnasium, to be given on the condition that the women’s college merge into a single financial entity with the rest of the University. 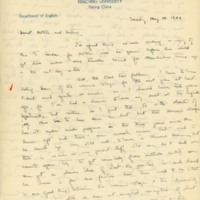 While the school desperately needed the money, the faculty found the terms of the gift to be highly objectionable: they were convinced that an amalgamation with the University would mean the corrosion of their institutional independence, followed inevitably by the loss of the unique aspects of their educational setting that had been specifically tailored to the needs of women. The debate was over the purely administrative matter of whether or not the treasuries should be merged, which would reduce bureaucratic red tape by drawing resources for both colleges from the same pool. However, the debate that followed reveals the incredible tension between the two sides of the institution, and the extent to which the administrative matter was inseparable from the more personal aspects of the institution’s identity. MBS’s account of the incident reveals the commitment and the level of intentionality that she and the other faculty members brought to the school and to the broader issue of women’s education. 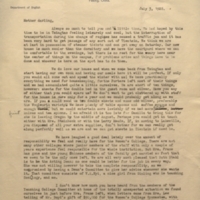 In her letter home on July 3, 1928, her tone is livid: “Out of bitter experience in defending the rights and position of women,” she writes, she and the other faculty had written a report to the Yenching College Committee in the US detailing “what we felt would be the steps in the eventual loss of all the values which have been so painfully acquired in the Women’s College.” While no one conjectured that it was the deliberate goal of the men to trounce the rights of the women, there was a feeling that a general insensitivity to their needs would gradually lead to encroachment upon their rights. A more centralized financial operation would allow the men, who she speculates felt “irritation …due to our apparently greater wealth”, to route more of the supposedly shared resources towards their own purposes in the name of fairness. 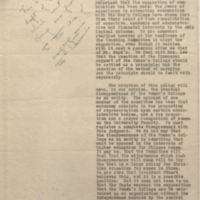 In her letter, MBS concedes that the initial strategy of complete opposition that she and the other faculty had taken served only to breed resentment rather than progress, and she imagines that the route forward might have to be one of compromise and cooperation, if only to save relations with the University. Either way, there was a sense that the women students needed to be insulated: the more aggressive approach had apparently “meant that we had to protect the position of the women students against the bitterness and annoyance of the men”, however, a compromise would mean that “we shall still have to protect the position of the women, this time against economic pressure and the indifference of the men.” The two documents featured on this page demonstrate the extent to which supposedly benign administrative issues such as financial processes were integral to issues of rights and equality in educational institutions. They also reveal the clarity and passion that MBS felt about the specific needs of women students, and show what a strong voice she could have in issues that demanded her conviction.